DROHOBYCH - DROHOBYCZ - DROGOBYCH - DROGOBICH, information page on town in Western part of Ukraine (Ukraina /Ucraina). It numbers about 80.000 inhabitants and is located 60 km south from Lviv. Has a few masterpiece churches and is hometwom to Bruno Schulz, Maurycy Gotlieb and Georgius de Drohobycz. Nearby towns: Boryslav, Truskavets, Lviv. Drohobych in Ukrainian, Drogobych in Russian and Drohobycz in Polish. It is a city (1990 est. pop. 77,000. Today it has ab. 80,000 inhabitants) in Lviv (Lvov/Lwow) region of Western Ukraine, in the North Carpathian foothills. 60 km south from Lviv. The closest international airport is in Lviv (Lvov). Drohobych is a major petroleum-refining center of the Boryslav oil field (oil refinery Halychyna is based in Drohobych), it is linked by an oil pipeline with Boryslav and a natural gas pipeline with Dashava. An old Ukrainian settlement, Drohobych belonged to the Galician principlaity of Kyivan Rus' until the 14th century, when Galicia was taken by Polish king Kazimierz to Poland. It was taken by Austria in 1772 but reverted to Poland in 1919 for 20 years, after short lived Western Ukrainian National Republic (ZUNR) lost the war with Poland. In 1939 it was occupied by Soviet troops and included in Soviet Ukraine, now independent. With Soviet occupation repressions and persecutionas started against local Ukrainian and Polish population, especially against Ukrainian Greek Catholic and Polish Roman Catholic priests. Thousands of simple locals were killed or deported to Siberia and labour camps. Private property and businesses were forbidden and land collectivized. During Soviet times Drohobych became isolated from the external world. Only with the breal of Soviet Union it became possible to visit the town. In 1945 during special operation "Vistula" most of Drohobych Poles were deported to Western Poland. 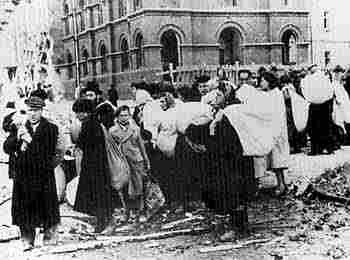 Most of Drohobych Jews were killed by Nazis, many escaped east. For a while Drohobych was administrative center of newly created Drohobych oblast', which was lated incorporated into Lviv oblast as it is still today part of it. 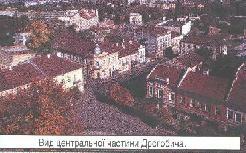 Before 1939, Drohobych had large Jewish minory. It had 35.000 inhabitants then and 40 % were the Jews. 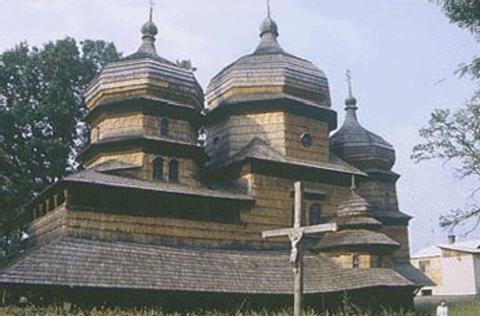 Jewish Presence in Drohobych was first mentioned in the 15th century and town's Jewish Population in 1939 numbered from 15,000 to 17,000. In 1939, the town's population was made up of 10,000 Poles, 10,000 Ukrainians and 15,000 Jews living in an uneasy coexistence. Fate of Jews in WWII: Drohobych Jews sent to Belzec extermination camp. Many of them were killed in the nearby forest of Bronice. 400 remained alive in 1944. Drohobych was a hometown to Polish Jewish 19th century revolutionary painter Maurycy Gotlieb (1856-1879, whose painting "Jesus Preaching in the Temple" was a revolutionary piece because it no longer shows Jesus as an Italian or German, but as a Jew preaching to his fellow Hebrews). Drohobych gave the world other famous Jewish poet, painter and artist Bruno Schulz (Bruno Szulc). Schulz was killed by SS officer Guenther in November 1942. Drohobych was also a cradle to Ukrainian astrologist, writer, doctor of Medicine and Philosophy of Bologna University Yuriy Drohobych (Kotermak, lived in 1450-1494), also known as Georgius de Drohobycz in Latin.The most famous Ukrainian - Galician writer and poet Ivan Franko was born in Drohobych county (village Nahuyevychi). 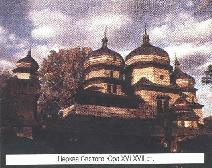 In 1864-1867 he attended the normal school operated by the Basilian monastery in Drohobych. In 1867-1875 I. Franko studied in the Drohobych Gymnasium (secondary school). He wrote about his school years in the short stories : Hrytseva shkilna nauka (Hrytz' School Lesson), Schoenschreiben (Caligraphy), Olivets (The Pencil), U Stoliarni (In the Wood Shop). Because of I. Franko, the Drohobych Pedagogical University was named after him. City has also Pedagogical State University (where both of my parents studied and got to know each other) as well as private Yuriy Kotermak Medical Institute. 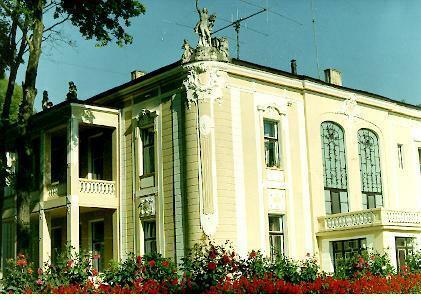 Dont miss also Drohobych Land Museum "Drohobychchyna" in the city. It functions since 1940 and numbers 25 halls with different archeological, ethnographic and historical exhibitions. Drohobych's sister city in the US is Muscatine in Iowa. My uncle Ivan used to live in Drohobych and I visted him there many times. Now he moved to nearby Truskavets, though his daughter and family still lives in Drohobych (at Volodymyra Velykoho Street, where I was a few times). For more info on him check: Pessina Longo H., Georgius de Russia, rettore a Bologna nel XV secolo. - Bologna: CLUEB, 1988. Page created by Roman Zakharii (from Berezhany in Western Ukraine. Berezhany is situated ab. 90 km east of Drohobych in Ternopil region) on 13.08.2001 in Oslo, Norway. Updated on 06.08.2013 in Reykjavik, Iceland.